In honor of all the big fat contradictory fatty information out there, I’d like to ask us all to pause and have a moment of simultaneous screaming. I get very weary of hearing fat information that contradicts. I used to think fat was bad. I used to feel terrible guilt anytime I ate anything with cheese or butter and heaven forbid if I ever indulged in french fries. So, what’s the truth? IS fat bad? I’m just going to share where I’ve landed on the matter and of course I am of the opinion that I am right. :) But as we all know, I am a normal (and often scatterbrained) mom who often carries her own light saber around for protection. I’m not a fat research specialist…so you can take this information or leave it. From what I’ve read, heart disease and obesity did NOT begin to be a big problem in the US until right about the time we began to switch out butter with margarine and our whole fat with low fat. The less saturated fat we have eaten as a nation, the unhealthier (and heavier) we have become, even though saturated fat is blamed for bad health. Most vegetable oils (those low in saturated fat) sold in the store are rancid before they even make it to our kitchens and rancid oils tend to freak out our insides. These are the oils that most restaurants use. Oh and also, most low fat products have quite a few artificial flavors and lots of sugar added to make up for the taste that is pulled out along with the fat. Hmm. So are fats bad for us? Yes, some of them most certainly are. But does that mean we should all “go low fat”? Choosing the right fats for our health is important. In fact, my research often tells me that eating a nice amount of fat (the good ones) is actually necessary for good health. Butter – I’m talking about real butter, not margarine. People interchange the names of the two, but margarine isn’t butter, it’s nasty, so just make sure you know that I’m talking about BUTTER here. I love that butter is pure with only one or maybe two ingredients: Cream and Salt. I’d recommend that you buy the “Unsalted Butter” but watch out because unsalted varieties usually have other additives labeled as “flavorings”. Grr, don’t add flavorings (aka MSG) to my butter!!! Give me the pure stuff!! So, if I can find an unsalted butter that is ONLY cream, I go for it, otherwise I go with salted. 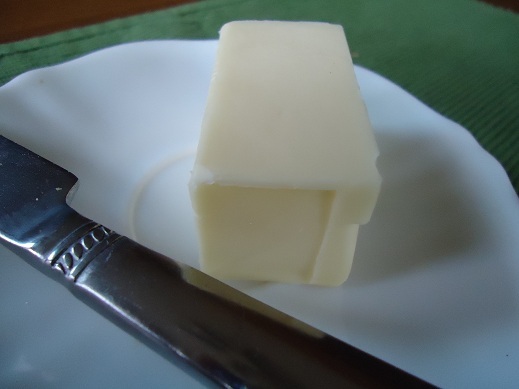 Butter made from raw, pastured cream is THE BEST EVER for your health if you can get your hands on some. Coconut Oil – When it comes to healthy oils, it doesn’t get much better than coconut oil. Find out here how to receive a free book about the benefits of coconut oil. There are two main varieties of coconut oil: Unrefined and Virgin. Both are good for you, especially when you buy them from a good source like Tropical Traditions or Mountain Rose Herbs. Unrefined Coconut Oil has a very mild taste and does not taste like coconut, which makes it good for frying (when you don’t want your chicken nuggets to taste like coconuts). Virgin Coconut oil has a fabulous coconut flavor and is great for baking! Palm Oil or Palm Shortening – I am so excited to find that Palm Shortening can be used to make a fabulous and healthy pie crust!!! I often melt some palm shortening into my electric skillet to fry donuts or french fries. There is no flavor in this shortening so your french fries taste like french fries…only better! Yeah, who doesn’t love a french fry that tastes better than a french fry!! Olive Oil – Of all the controversial fats, Olive Oil stands up to the test on both sides of the fence. I use olive oil to stir fry my veggies, to cook chicken and to make salad dressings. I prefer organic, and always try to find it in a dark colored bottle as the sunlight does compromise it’s quality. Full Fat Dairy – Oh yes, bring on the whole milk and rich cream. More about dairy another time, because wow, this post is getting long isn’t it?